As the lawn care experts in Toms River, we get a ton of questions from those who have homes in our areas. They want to know all about what they can expect when they have a sprinkler system installed and thereafter. We like to be as helpful as we possibly can be and therefore have decided to put together a list of the questions we get the most often, as well as the answers to them. Continue reading below to get the information you need. Do I need to be at my house to have my sprinkler system installed? We understand that you have a busy schedule and therefore, it is not imperative that you are home while we install your sprinkler system. On the other hand, we will need to be able to access both the inside water line and timer without you being there. If that is not a possibility, you can always arrive just long enough to give us access and we will take care of the rest. How long does service normally take? How long does installation take? This really depends what sort of service you are having completed. For the most part, service should not take any longer than 30 minutes to an hour. If you are having your initial installation completed, your service will take a little bit longer. We would estimate that it would take a couple of hours since there is inside plumbing involved. Will sprinkler installation ruin my lawn? Absolutely not! We use the very best equipment that tunnels the pipe underground so that there is very little if any damage to your lawn. Conversely, if your lawn has a lot of rocks and/or roots, the process will not be very neat. However, in cases like this, lawns normally grow back in 7 to ten days. Please understand that it is our desire to make your lawn look better and not worse so we will do everything we possibly can to make sure that your yard remains intact as we work on it. Will my lawn mower break my sprinklers? This is something you don’t have to worry about. Ever since the 1970s when plastics overtook the industry, your sprinkler-loaded nozzle should not be a problem where you lawn mover is concerned. How long do you expect your system to last? When you have your sprinkler system taken care of, you can bet that it will last you a long time. We like to estimate that our sprinkler systems should last you 30 years at the very least. Talk about an investment! What sort of maintenance is recommended and how much will it cost? Every fall, your system should be drained with compressed air. This is known as a sprinkler blowout. Besides that your system should be turned on and cleaned each spring. This should not cost you more than $300 dollars every year. 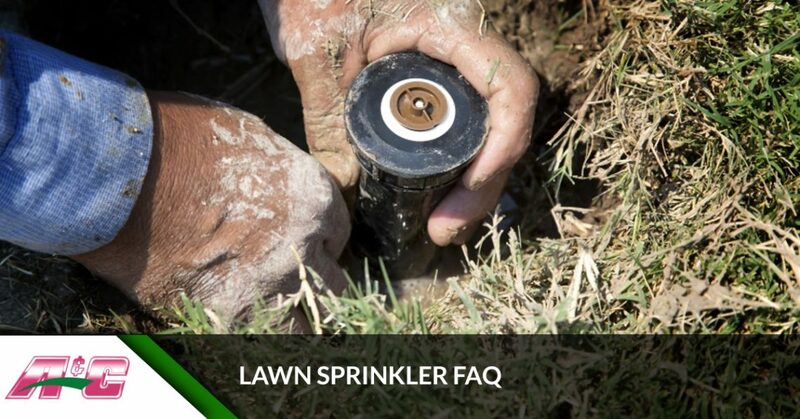 What are the different types of sprinklers that are available? There are two main types of sprinklers you can choose from when you are having your irrigation system installed. First, there are rotary sprinklers which are the type you see that rotate. They will shoot a constant stream of water approximately 30 or 40 feet. If you have a lot of grass area in your yard, this may be your best bet. These types of sprinklers are also great if you have shrubs in your lawn, as they can be strategically placed so that your shrubs also get watered when your sprinklers are on. On the other hand, you can have mist/spray sprinkler installed in your lawn. These types of sprinklers do not turn and they spray from four to 15 feet. Ready To Hire The Best In The Business? If you are ready to have your new sprinkler system installed, there is no better company to trust than A&C Sprinkler. We pride ourselves on not only delivering the very best services but we also know that we use the best products and deliver everything we do with a smile. If you are interested in having a new irrigation system installed at your home, give us a call today. We can give you any additional information you need and provide you a quote.